AN ENTIRE COMPANY FOCUSED ON ECO-FRIENDLY IMPLEMENTATION. Commercial HVAC installation is required for new construction and when conducting an equipment retrofit for a redesigned facility. Across the entire spectrum of heating, cooling, and thermal controls, efficiency is required via a cohesive plan that involves tech and innovation. At the forefront of industry research and premium grade workmanship, our team provides a price compatible solution to accommodate your office, storefront or facility. AN ENTIRE STAFF EMPLOYED FOR AIR QUALITY AND REPAIRS. Appointing EPA certified technicians to service your HVAC system, our equipment features longevity and quality control. While our maintenance division targets large facility servicing, our mindset is small enough to feature unparalleled customer care. Every commercial environment requires adequate maintenance to guarantee working parts and optimal air quality. OUR ECO FRIENDLY FOOTPRINT IS HVAC AT ITS BEST. GREEN is in our business name! 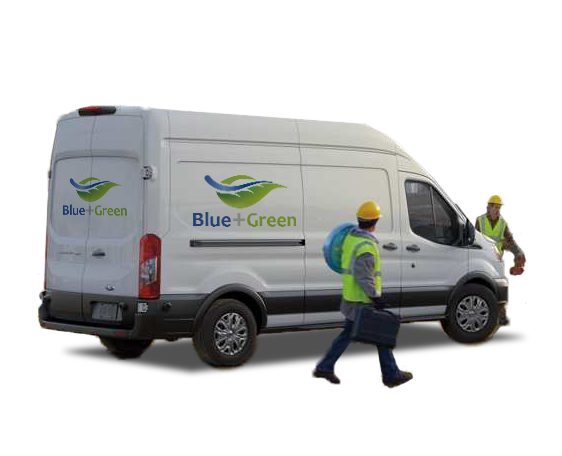 Blue plus Green was founded with the initiative to be small enough for customer care and big enough for corporate HVAC solutions. High-end facilities and large-scale hospitality premises require good quality airflow and temperature controls. We believe that HVAC solutions start at installation, but last with ongoing efficiency. Our installation crew and technicians are resourceful, professional and experienced, making a big impact via focused HVAC performance that’s built to last. Eco friendly + customer care. "Shmuly is an independent thinker that is not afraid of any challenges when it comes to HVAC work. He has worked hard at developing his technical and project management skills as well as his HVAC estimating skills and over the past year has grown with this experience." Execution, Delivery, Professionalism, and Accuracy... Expect them all working with Blue+Green. Experts in HVAC. Shmuly is dedicated to client delivery and will go the extra mile to get the job done. Working with Shmuly is Highly Recommended. "As an HVAC equipment supplier, I have known Shmuly and Blue plus Green for a few years, but in that short time, I have known him to do quality installations and offer competent after market service follow thru on his projects. I would recommend him and his company to anyone looking for a capable contractor in the HVAC field." "On a large and complex, commercial project, Shmuly was always on time with right product and the right solution. He was the one major sub-contractor who never created friction. A real pleasure. I continue to use him." "Professional and to the point. Well organized. Openminded willing to here suggestions re HVAC." HVAC Estimating at DASCO Supply Co.
"Shmuly loves to get things done right the first time. He is very energetic, and will be on your head until you will do it the right way. He is honest and open when there is a problem to be solved outside of his scope of work, and will do the shopping for the stuff you need to have installed. Neither is he ashamed to adhere to others opinions"